If you’re tired of the afternoon slump or often feel like you need to unbutton your jeans and take a nap after eating, try some different food choices. Here’s how to feel great after eating. 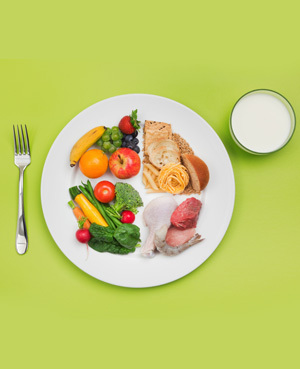 Fruits and vegetables should make up half your plate. Half of your daily grains should be whole grains. Lean proteins and low-fat dairy are smart choices. Eating this way will help keep you energized and feeling great throughout the day. Everyone deserves to indulge her sweet tooth once in a while, but too much of a good thing can be harmful. Refined sugars and certain carbohydrates — such as white flour and white rice — may give you a quick energy boost, but then they cause your blood sugar levels to crash quickly, leaving you fatigued and hungry. If you must have something sweet, choose a piece of fruit. You’ll feel great after eating high-fiber and low-fat foods such as whole-grain bread, quinoa, beans and fresh berries because you’ll be comfortably full. As a bonus, you won’t get as hungry between meals, either. This may sound like a no-brainer, but taking the time to slow down and enjoy a meal will help you feel great after eating, too. Enjoy the simple pleasures of cooking and serving a great meal.